Introduction: The treatment of choice for intracapsular hip fractures in younger patients is reduction and internal fixation as opposed to primary arthroplasty, which is generally reserved for older patients. The long-term potential consequences are avascular necrosis (AVN) and non-union (NU) with reported rates of 23% and 9%, respectively. Previous studies have been in dispute in regard to the effect of time-to-surgery upon the risk of the complications. The purpose of this study was to compare the rates of AVN, NU and to examine the rate of revision arthroplasty after early and delayed fracture fixation. Methods: This retrospective study included fifty- five adult patients, 65 years and younger, treated with reduction and internal fixation following an intra-capsular hip fracture. The patients were divided into two groups; patients treated with early fracture fixation (EFF) (<12 hours after injury) and patients treated with delayed fracture fixation (DFF) (>12 hours after injury). Results were compared regarding rates of AVN, NU, conversion to arthroplasty and complications. Results: Twenty-one patients underwent early fracture fixation, and thirty-four underwent delayed fracture fixation. No significant differences between the EFF and DFF group were noted regarding AVN, NU and conversion to arthroplasty (p>0.05). In the EFF group, 5 patients (23.8%) had AVN, 3 patients (14.3%) had NU and 2 patients (9.5%) ultimately had conversion to arthroplasty. In the DFF group, 3 patients (8.8%) had AVN, 6 patients (17.6%) had NU and 5 patients (14.7%) underwent conversion to arthroplasty. These differences were not significant. Conclusions: In spite of theoretical advantages for EFF, the results of this study did not demonstrate a benefit regarding rates of AVN, NU and conversion to arthroplasty. While the main advantage of EFF remains a marginally shorter hospitalization, in cases where prudent surgical preparation is required, the delay in surgery should not affect surgical judgment. Hip Fractures in the elderly population are one of the most frequently encountered conditions in orthopedics however, they are less common in young adults. The treatment of choice in young adult patients with intracapsular hip fractures is fracture fixation in order to preserve the native femoral head thereby enabling higher functional demands and avoiding concerns of arthroplasty. Long-term potential complications of this treatment are avascular necrosis (AVN), non-union (NU) and consequently, the need for arthroplasty [1,2]. The reported occurrence rate of these complications varies greatly in the literature however metaanalyses reported a 14-23% rate of AVN, 9% rate of NU and 10-20% need for arthroplasty [3,4]. Several studies have examined possible factors that may contribute to the long-term success of fracture fixation, however, with the exception of initial fracture displacement; all other factors have not been conclusive . One of the possible contributory variables is time elapsed between injury and fracture fixation, however the issue of prompt intervention is debatable and there is limited evidence to support a timeframe for fracture management. The basis for the hypothesis that prompt intervention can reduce complications lies in the understanding that due to the vulnerable blood supply to the femoral head, any fracture within the capsule has the potential to damage the blood supply to the femoral head with this risk increasing with greater levels of displacement. Therefore, re-establishing blood supply to the femoral head by prompt reduction and stable fixation is critical and should be achieved as soon as possible [6,7]. The conflict in the literature regarding the importance of prompt internal fixation is currently ongoing. 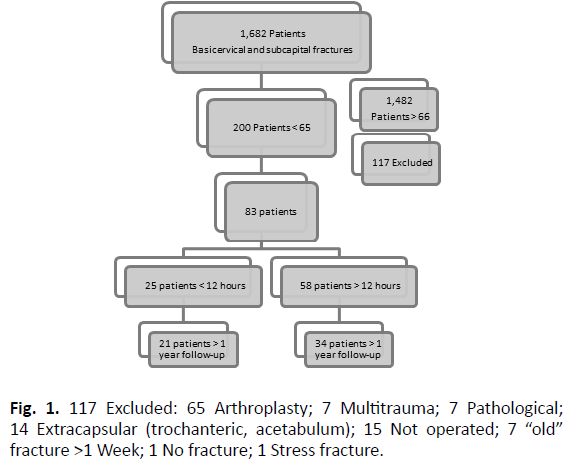 The purpose of this study was to compare the rates of AVN, NU and conversion to arthroplasty after early fracture fixation (EFF- under 12 hours) and delayed fracture fixation (DFF-over 12 hours). This is a retrospective comparative study of patients with intracapsular femoral neck fractures admitted to one medical center between the years 2004 and 2013. Patients were identified by a query of our institutional database using the following keywords: âsubcapital fracture of hipâ, âfemoral neck fractureâ and âcervicotrochanteric fracture of hipâ. Fractures were classified according to the system of the Orthopaedic Trauma Association . Inclusion criteria included patients under the age of 65 and patients who underwent reduction (open/closed) and fixation. Exclusion criteria included patients with an ISS score >15, pathological fractures due to corticosteroid treatment or malignancy, previous surgery on the ipsilateral hip or femur, patients with inadequate medical records and failure to complete one year of follow-up. However, patients who met the primary outcomes were included in the study, regardless of length of follow-up. All surgeries were performed by a specialist in orthopedic trauma. Patients were divided into two groups according to surgery timing: early fixation (treated within twelve hours after admission) and delayed fixation (treated more than twelve hours after admission) [3,9]. Failure endpoints were defined as AVN of the femoral head, NU and conversion to arthroplasty (hemiarthroplasty or total hip replacement). To evaluate AVN, the radiographic criteria of Ficat and Arlet were used . Stage I AVN was diagnosed by bone scintigraphy. More advanced stages were diagnosed by plain radiographs of hips. NU was defined by the absence of fracture healing after a period of 6 months or hardware failure and cut-out. Fracture displacement was classified as non-displaced (Garden I or II) or displaced (Garden III or IV) according to the Garden Classification . Classification of the fracture and occurrence of AVN or NU were crossexamined by two of the authors independently (PR and EH) and, when in conflict, by the chief investigator (TH). Patientsâ demographics, time to surgery, surgical variables, complications, preoperative and postoperative radiological studies of the injured hips (anteroposterior and cross-table lateral views) were reviewed. Institutional review board (IRB) approval was obtained for this study. Analyses were performed using the SPSS 22.0 as the platform. The data was analyzed to determine the effect of the time from the admission to fracture reduction on the outcome measures. The prevalence of AVN, NU and arthroplasty were compared between the two study groups using chi square tests with 95% confidence interval. A binary logistic regression model was used to study the effect of fracture displacement pattern on the development of the study primary outcomes (AVN, NU and arthroplasty). Fifty-five patients met the inclusion criteria (Fig. 1). Of these, 21 (38%) were operated within 12 hours of presentation (EFF) with a mean time to surgery of 6.8 (Â± 2.5) hours, while 34 (62%) were operated more than 12 hours following presentation (DFF) with a mean time to surgery of 43.1 (Â± 31.2) hours (p=0.00). No significant differences between the EFF and DFF group were noted with regard to AVN, NU and conversion to arthroplasty (p>0.05). 5 patients (23.8%) developed AVN following EFF compared to 3 patients (8.8%) in the DFF group. Following EFF, 3 patients (14.3%) had NU compared to 6 patients (17.6%) in the DFF group and 2 patients (9.5%) had conversion to arthroplasty following EFF compared to 5 patients (14.7%) in the DFF group (Fig. 2). The relevant demographic and clinical data are presented in Table 1. Fig 1. 117 Excluded: 65 Arthroplasty; 7 Multitrauma; 7 Pathological; 14 Extracapsular (trochanteric, acetabulum); 15 Not operated; 7 âoldâ fracture >1 Week; 1 No fracture; 1 Stress fracture. The groups differ significantly (p=0.013) regarding fracture displacement, with EFF group having higher proportion of displaced fractures (85.7%) compared to DFF (52.9%). However, logistic regressions to determine the influence of fracture displacement and time to surgery on AVN, NU and conversion to arthroplasty were found to be insignificant (p=0.109, 0.115, 0.089, respectively). A post hoc power analysis using the G*Power program as reported by Erdfelder, Faul, and Buchner in the year 1996, presented an effect size of 0.33 (i.e., a moderate effect, according to Cohenâs, in 1977, effect size conventions). In order to reach an effect size of d=0.8 a total sample of 232 people would be needed. In regard to complications, there was no advantage to the EFF compared with the DFF. 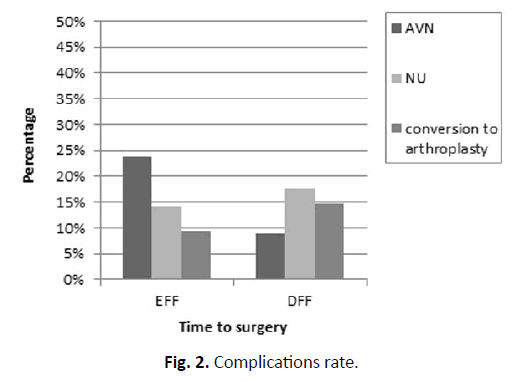 The prevalence of complications free patients (AVN, NU, arthroplasty and minor complications) was 13 (62%) in the EFF group and 23 (67%) in the DFF group (p>0.05). Associated complications were encountered in one patient in the EFF group (infection that resolved with minor debridement) and one patient in the DFF (DVT and PE two weeks post- operatively). Focusing only on displaced fractures, the prevalence of complication free patients was 10 of 18 (55.5%) and 11 of 18 (61.1%) in the EFF and the DFF groups, respectively (p>0.05). As would be expected, the length of hospitalization was significantly (p=0.02) higher in the DFF group (5.3 Â± 1.9) compared to the EFF group (4.0 Â± 2.2). We controlled for age and gender and while a significant difference in age exists (p=0.001), a logistic regression model analyses to determine the influence of age and time to surgery on AVN and arthroplasty were found to be insignificant (p=0.197, p=0.076, respectively), yet regarding NU the difference remain significant (p=0.011). No significant differences between the groups were noted regarding gender (p>0.05). The proportions of patients treated with cannulated screws, DHS and FND (Targon Femoral Neck implant) were similar between EFF and DFF groups. Further analyses using a logistic regression model to determine the influence of Fixation type and time to surgery on AVN and arthroplasty were found to be insignificant (p=0.115, p=0.013 respectively), yet the difference regarding DHS remain significant (p=0.021) (Table 1). Table 1. Demographic and clinical data (***p<0.001, **p<0.01, *p<0.05). In this retrospective comparative study, two groups of patients were compared; those undergoing fixation within 12 hours of admission and those with a delayed fixation, defined as surgical fixation, more than 12 hours from admission. Examining the outcome based on rates of avascular necrosis, non-union and arthroplasty revealed no significant difference between these two groups. These results are in line with various studies published over the last decade. The uniqueness of this study is the emphasis placed on rates of arthroplasty which were not specifically examined in previous studies. In concurrence with the latest literature, EFF did not achieve better results than DFF. In all three primary outcome measures (AVN, NU and arthroplasty), we found no significant advantage for EFF over DFF. This might have been explained by the higher rate of displaced fractures in the EFF group, perhaps due to the fact that the non-displaced fracture required longer assessment until final diagnosis of the fracture. However, logistic regression models dismissed this assumption. As would be expected, the time to fracture fixation influenced the total length of hospitalization, resulting in approximately one day longer hospitalizations in the DFF group. While hospitalization was longer, this did not result in higher rates of posts-operative complications. The ultimate goal of treatment in young adults presenting with fractures of the neck of the femur is to preserve the native femoral head and to hasten the return to previous function. Previous studies have shown that avoiding the major complications of these fractures, namely AVN and NU, may lead to improved functional outcome. Our results suggest that the rate of AVN, NU and arthroplasty does not depend on time from presentation to fracture fixation. While many factors have been implicated as culprits leading to development of AVN and NU, one of the more intriguing modifiable factors would be the time from fracture to surgical fixation. The theoretical basis for this theory is based on the unique characteristics of the blood supply to the femoral head, which relies on mostly a retrograde blood supply originating from the medial circumflex artery. At the time of fracture occurrence, this blood supply is damaged, either by complete severing of these vessels or by kinking of the vessels. In theory, a prompt unkinking of the vessels will improve blood supply to the femoral head. Another possible explanation is that non-union and avascular necrosis occur in part due to increased intra-articular pressure following the fracture. Some surgeons routinely perform a capsular decompression at the time of surgery in order to reduce intra- articular pressure thereby improving blood supply to the femoral head, although various studies have not shown this practice to be effective. Capsular decompression was not practiced at our institution and therefore was not examined. Over the last two decades a number of studies have specifically addressed the issue of time to fracture fixation and the influence on complications, specifically AVN. Loizuo and Parker reported on patients with intra-capsular hip fractures with regard to the effect of delay of surgical treatment on AVN risk and found no association between operation delay and the incidence of AVN . Other large-scale studies reported similar results [13,14]. The limitations of these studies were the small number of patients in the young age group (< 65) and the fact that the outcomes were not specific to young adult patient. In addition, the definition of early vs. delayed treatment was inconsistent. In contrast to these studies, only relatively small case series exist focusing on the young age group. Initial reports have found association between delayed treatment and the development of AVN [9,15], while subsequent studies, such as Razik et al. could not demonstrate that same effect and suggest that time to internal fixation is less important in the prevention of AVN of the femoral head than was initially thought . In spite of increasing evidence disregarding time of fixation as an important factor in fracture healing, this issue is still debatable. This present study does not hold the power to decisively draw a conclusion in this matter. The importance of our study lies in its contribution to the growing body of evidence and to the specific focus on the ultimate need for conversion to hip arthroplasty which encompasses the major consequence of fracture fixation failure. Ly T.V., Swiontkowski M.F. : Treatment of femoral neck fractures in young adults. J Bone Joint Surg Am. 2008;90:2254-2266. Haidukewych G.J., Rothwell W.S., Jacofsky D.J. et al. : Operative treatment of femoral neck fractures in patients between the ages of fifteen and fifty years. J Bone Joint Surg Am. 2004;86-A:1711-1716. Damany D.S., Parker M.J., Chojnowski A.: Complications after intracapsular hip fractures in young adults. A meta-analysis of 18 published studies involving 564 fractures. Injury. 2005;36:131-141. Slobogean G.P., Sprague S.A., Scott T., et al. : Complications following young femoral neck fractures. Injury. 2015;46:484-491. Yang J.J., Lin L.C., Chao K.H., et al. : Risk factors for nonunion in patients with intracapsular femoral neck fractures treated with three cannulated screws placed in either a triangle or an inverted triangle configuration. J Bone Joint Surg Am. 2013;95:61-69. Panteli M., Rodham P., Giannoudis P.V. : Biomechanical rationale for implant choices in femoral neck fracture fixation in the non-elderly. Injury. 2015;46:445-452. Jakob M., Rosso R., Weller K., et al. : Avascular necrosis of the femoral head after open reduction and internal fixation of femoral neck fractures: an inevitable complication? Swiss Surg. 1999;5:257-264. Marsh J.L., Slongo T.F., Agel J., et al. : Fracture and dislocation classification compendium - 2007: Orthopaedic Trauma Association classification, database and outcomes committee. J Orthop Trauma. 2007;21:S1-133. Jain R., Koo M., Kreder H.J., et al. : Comparison of early and delayed fixation of subcapital hip fractures in patients sixty years of age or less. J Bone Joint Surg Am. 2002;84-A:1605-1612. Ficat R.P. : Idiopathic bone necrosis of the femoral head. Early diagnosis and treatment. J Bone Joint Surg Br. 1985;67:3-9. Garden RS. : Malreduction and avascular necrosis in subcapital fractures of the femur. J Bone Joint Surg Br. 1971;53:183-197. Loizou C.L., Parker M.J.: Avascular necrosis after internal fixation of intracapsular hip fractures; a study of the outcome for 1023 patients. Injury. 2009;40:1143-1146. Holmberg S., KalÃ©n R., Thorngren K.G. : Treatment and outcome of femoral neck fractures. An analysis of 2418 patients admitted from their own homes. Clin Orthop Relat Res. 1987;218:42-52. Barnes R., Brown J.T., Garden R.S., et al. : Subcapital fractures of the femur. A prospective review. J Bone Joint Surg Br. 1976;58:2-24. Swiontkowski M.F., Winquist R.A., Hansen S.T. : Fractures of the femoral neck in patients between the ages of twelve and forty-nine years. J Bone Joint Surg Am. 1984;66:837-846. Razik F., Alexopoulos A.S., El-Osta B., et al. Time to internal fixation of femoral neck fractures in patients under sixty years--does this matter in the development of osteonecrosis of femoral head? Int Orthop. 2012;36:2127-2132.